The world may think bacon is just a trend and will be replaced by something new, but I don’t care. I will always eat bacon-wrapped tasty things and I will always keep at least two packages of bacon in the freezer for backup. If you braise a hunk of slab bacon, I’ll eat it. I still enjoy the piece of candied bacon in the bloody mary at Small Bar, even if I can’t really taste the bacon vodka that’s in it. Bacon is good. I’m sorry, that’s just all there is to it. Most Sundays, I’ll make a nice breakfast for the two of us that usually involves a side of bacon. If I’m in a hurry, I’ll throw the bacon in a cast iron pan and weigh it down with my bacon press (it flattens the bacon but also makes it cook faster). If I’m up before Travis, I’ll take the time to cook the bacon in the oven – it’s easier, less messy, and I can cook more pieces at once. Line a baking sheet with foil and place a cooling rack over it (note: I have no idea if cooling racks are oven-safe but mine are stainless steel and don’t seem to be taking any damage.) place bacon strips on the cooling rack. Bake somewhere between 325 and 400 F (depending on how quickly you want it to cook) for about 20-25 minutes. I know that seems really vague, but bacon isn’t really an exact science. Some people like it cooked and chewy, some like it hard and crisp. I’m somewhere in the middle. Basically, when a piece of bacon looks like it’s cooked, I’ll take it out and let it cool. If it’s crisp enough for me, then I take the whole pan out of the oven. If not, I leave it in for a few more minutes. I also slice bacon strips in half. I sort of do it to make the bacon easier to handle (also easier to wrap and freeze) but I also do it to trick us into thinking we’re eating more bacon than we really are. Bacon may be tasty, but I’ve yet to come across a study that shows it’s also good for us. So, if we eat 4 bacon pieces, we’re really only eating 2 complete strips of bacon, which seems like a reasonable serving for a once-a-week breakfast. Anyway – bacon is good, cocoa bacon is better. I’m always one to experiment with bacon and incorporate more flavors. I’ve made this Maple Candied Bacon and also just dredged bacon in brown sugar (very easy, just as tasty). I think it was Mary’s Eclipse brunch post where I first head of cocoa+bacon, but it sure sounded good. I’m not a fan of chocolate covered bacon (or that bacon chocolate bar), but cocoa seemed like a good fit – chocolate flavor without the overpowering chocolate sweetness. 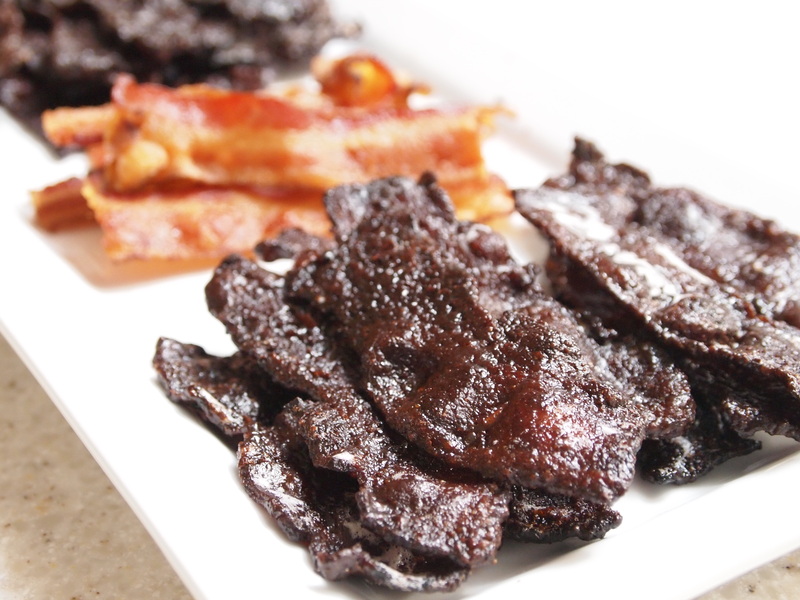 I really don’t have a recipe, but the good news is making cocoa dusted bacon is super easy. I recommend making extra – inevitably, a piece of two tends to disappear before breakfast is ready, while breakfast is being plated, and as breakfast-dessert. It also re-toasts nicely to go with a weekday scone, egg, bread, etc. 2. Line a baking sheet with foil (for easy cleanup) and place a cooling rack over the pan. 4. Dredge the bacon in the cocoa/sugar and lay flat on the cooling rack. One pound of bacon usually fits on two baking sheets/racks. 5. Bake for 30-35 minutes. Remove the bacon from the rack while still hot and lay it on a plate. The bacon may still seem soft when you poke at it, but it’ll crisp up once it cools. If you let the bacon cool on the rack, it’ll stick and then break into pieces when you try to scrape it off. The last time I made cocoa bacon, I didn’t have enough of the cocoa/sugar mixture for all the bacon. So, I just left some bacon “plain”. This turned out to be a really happy accident – the cocoa bakes up really dark, so it’s hard to tell when the bacon is getting overcooked. If you leave a few slices “plain”, you can see the color of the bacon and have a better idea of when it’s cooked. I made these for our last SD Food Blogger Roundtable and I think they went over pretty well! This entry was posted in food, recipes and tagged bacon, cocoa dusted bacon. Bookmark the permalink. I have been dreaming of these since I tried them. Thank you for the recipe. They were delicious! Your cocoa bacon was awesome! Bacon is a fine ingredient for many, many things and I’m sure it will never go out of style. I had serious bacon craving this weekend and ended up having a chicken-bacon-spinach sandwich. Yum. Thanks! A chicken-bacon-spinach sandwich sounds tasty! Let me know how it turns out! And how it compares to Eclipse – I’ve never had brunch their, so maybe cocoa-glazed bacon is extra tasty. I need to try this now. Your picture looks mouthwatering. Time to buy some bacon! See, if you kept back-up bacon in the freezer, it would be on hand for last-minute bacon tastiness!